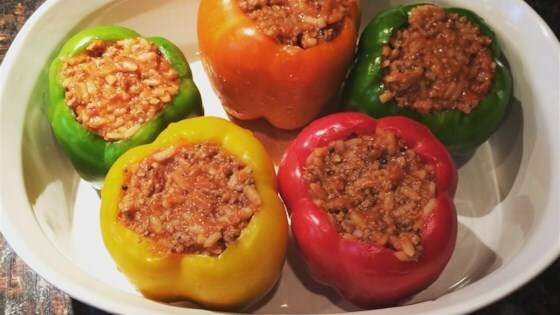 "This healthier stuffed peppers recipe uses an assortment of colored peppers, lean ground beef, brown rice, fresh onion and garlic, and natural tomato sauce. So colorful and so healthy!" Bring brown rice and water to a boil in a saucepan. Reduce heat to medium-low, cover, and simmer until rice is tender and liquid has been absorbed, 45 to 50 minutes. Cook and stir beef, garlic, and onion in a skillet over medium heat until meat is evenly browned and onion is softened, about 5 minutes. Remove and discard the tops, seeds, and membranes of the green, red, and yellow bell peppers. Arrange peppers in a baking dish with the hollowed sides facing upward. Slice the bottoms off the peppers if necessary so that they stand upright. Mix the browned beef, cooked rice, 1 can tomato sauce, Worcestershire sauce, salt, and pepper in a bowl. Spoon an equal amount of the mixture into each hollowed pepper. Mix the remaining tomato sauce and Italian seasoning in a bowl, and pour over the stuffed peppers. Bake in the preheated oven, basting with sauce every 15 minutes, until the peppers are tender, about 1 hour. Sprinkle the peppers with grated Parmesan cheese after baking. Simple yet hearty stuffed peppers that come together in 90 minutes or less. This recipe is a healthier version of Sausage and Rice Stuffed Peppers. This was good. I used ground turkey and added salt and pepper while it was browning in the pan. Very good! The only thing I did differently is to use seasoned black pepper and I added powdered onion and garlic. I cooked these in the crock pot and they came out perfect! VERY GOOD! I only used 3 peppers and halved them to make 6. I added 1 tbsp chili powder, because I thought it would be too bland as written. It was very good. I halved the peppers and enjoyed every great bite.